Flu Vs. Cold: What’s The Difference? Can’t tell the difference between the flu and a cold? Don’t feel bad. They’re both respiratory illnesses, but different viruses cause them. It can be tough to differentiate the two. In fact, you need to get tested within the first few days of illness to know for sure. Generally, though, the flu is much worse than the common cold. In fact, the flu can result in serious health concerns, like pneumonia. Cold symptoms are usually milder, like a stuffy nose and fatigue. If it’s a cold, it’s gradual. The flu is more abrupt. Fever is very rare for a cold, whereas it’s usual for the flu. Aches, chills, and fatigue are regular with the flu. Stuffy nose, sneezing, and sore throat: a few symptoms more common for the flu. As always, see your provider if you’re feeling feverish, achy, and fatigued. Common colds are the main reason that children miss school and adults miss work. Each year in the United States, there are millions of cases of the common cold. Adults have an average of 2-3 colds per year, and children have even more. Most people get colds in the winter and spring, but it is possible to get a cold at any time of the year. Symptoms usually include sore throat, runny nose, coughing, sneezing, watery eyes, headaches and body aches. Most people recover within about 7-10 days. However, people with weakened immune systems, asthma, or respiratory conditions may develop serious illness, such as pneumonia. Many different viruses can cause the common cold, but rhinoviruses are the most common. Viruses that cause colds can spread from infected people to others through the air and close personal contact. You can also get infected through contact with stool or respiratory secretions from an infected person. This can happen when you shake hands with someone who has a cold, or touch a doorknob that has viruses on it, then touch your eyes, mouth, or nose. Wash your hands often with soap and water. Scrub them for 20 seconds, and help young children do the same. If soap and water are not available, use an alcohol-based hand sanitizer. Viruses live on your hands, and regular handwashing can help protect you from getting sick. Avoid touching your eyes, nose, and mouth with unwashed hands. Viruses can enter your body this way and make you sick. Stay away from people who are sick. Sick people can spread viruses that cause the common cold through close contact with others. There is no vaccine to protect you against the common cold. There is no cure for a cold. To feel better, you should get lots of rest and drink plenty of fluids. Over-the-counter medicines may help ease symptoms but will not make your cold go away any faster. Always read the label and use medications as directed. Talk to your doctor before giving your child nonprescription cold medicines, since some medicines contain ingredients that are not recommended for children. Learn more about symptom relief. Antibiotics will not help you recover from a cold. They do not work against viruses, and they may make it harder for your body to fight future bacterial infections if you take them unnecessarily. Learn more about when antibiotics work. If your child is younger than 3 months old and has a fever, you should always call your doctor right away. Your doctor can determine if you or your child has a cold and can recommend therapy to help with symptoms. 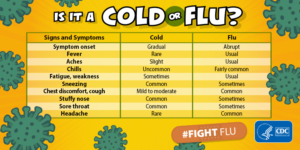 Are You at High Risk for Serious Illness from the Flu? Influenza, commonly called the “flu,” is a contagious viral infection that affects the respiratory system — your nose, throat and lungs. 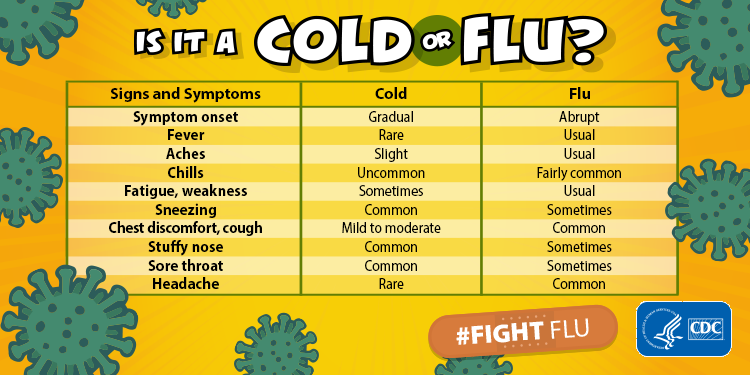 Symptoms of the flu can include fever, cough, sore throat, runny or stuffy nose, body aches, headache, chills and fatigue. Some people may also have vomiting and diarrhea. The flu can be an unpredictable and serious disease that can lead to hospitalization and sometimes even death. CDC estimates that from the 1976-1977 season to the 2006-2007 flu season, flu-associated deaths ranged from a low of about 3,000 to a high of about 49,000 people. Your best defense against influenza – and its possible complications – is to get vaccinated. In fact, CDC recommends that everyone 6 months and older get an annual flu vaccination. The flu vaccine is safe and can’t cause the flu. The flu shot—not the nasal spray—is recommended for people with chronic medical conditions. Millions of Americans are impacted by long-term health conditions, but many people aren’t aware that they have one of these conditions. For example, diabetes affects about 26 million Americans, but it is estimated that 1 in 4 people with the disease don’t even know they have it. It’s important to ask your doctor whether you have a health condition that makes you more vulnerable to complications from the flu. In addition to those with chronic health conditions, many others are a high risk for flu complications because of their age or other factors. During the 2012-2013 flu season, 45% of adults hospitalized with laboratory-confirmed influenza had heart disease. Among Americans 20 years and older, 6.3% are morbidly obese (with a body mass index, or BMI, of 40 or greater). In pregnant women, changes in the immune system, heart and lungs make them prone to more severe illness from flu. In addition, a flu-infected pregnant woman also has an increased chance for miscarriage or preterm birth. In the United States, each year an average of 20,000 children younger than 5 years old are hospitalized because of flu complications. During the 2012-2013 influenza season, 169 flu-related pediatric deaths were reported. Among children 6 months and older, about 80-90% of flu-related pediatric deaths occur in children who have not received a flu vaccine. 9 out of 10 flu-related deaths in the United States occur in people 65 and older. 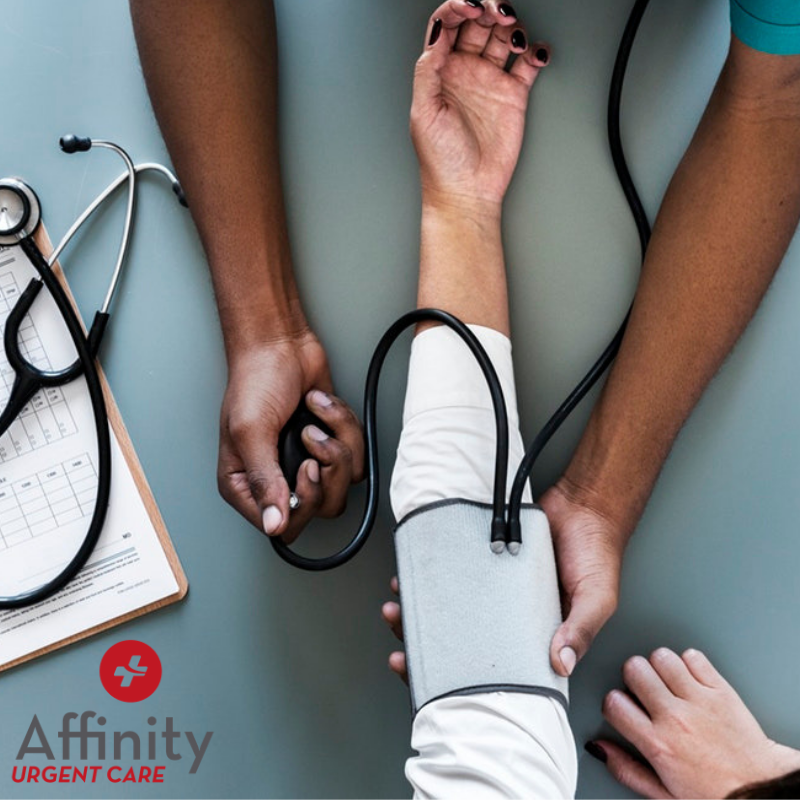 If you are currently living with a chronic health condition like heart disease, diabetes or asthma, certain behaviors are probably part of your daily routine, like watching your diet or glucose levels, taking your prescribed medications or keeping your inhaler on-hand. Make getting an annual flu vaccine another part of your health management routine—it’s your best defense against the flu and related complications. Since the flu is contagious, it’s also important that all of your close contacts are vaccinated. If you are at high risk for flu complications, be sure to ask your doctor about getting a pneumococcal vaccination, too. Pneumococcal vaccine can be given at any time during the year and may be given at the same time as influenza vaccine. A lot of what we believe about the common cold is myth. No, you won’t get a cold because you went outside with a wet head or slept in a drafty room. But here’s what is true. When you’re sick, some common mistakes can make your cold symptoms worse — or prevent you from getting better. If you’re feeling crummy and stuffed up, here are 7 things that could make your cold worse. 1. Pretending you’re not sick. This never works. You can’t ignore a cold. When you get sick, you need to take care of yourself. Your body needs extra energy when it’s fighting an infection. If you try to push through a cold, especially if you have a fever, you’ll exhaust yourself. That could make your cold worse. 2. Not sleeping enough. Getting enough sleep is key for a healthy immune system. One study found that sleeping less than 7 hours a night almost triples your risk of getting a cold in the first place. If your cold symptoms keep you up at night, try to go to bed earlier or take naps during the day. You need extra rest, however you get it. 3. Getting stressed. It turns out that stress can make you more likely to get a cold. Over time, high levels of stress hormones can stop your immune system from working normally. The result: More sick days. 4. Drinking too little. You need to drink a lot of fluid when you’re sick. Why? Fluids will help thin your mucus, making your sinuses drain better. Just about any fluid will help. Water, juice, hot tea, and soup are all good. Contrary to what you’ve heard, even milk is OK — the notion that it causes mucus build-up is a myth. 5. Drinking alcohol. Too much alcohol can leave you dehydrated and worsen cold symptoms such as congestion. It can also suppress your immune system and — potentially — interact with cold medications you’re taking. Until you’re feeling better, it’s best to lay off the booze. 6. Overusing decongestant sprays. Be careful with nasal decongestant sprays. They may work well at first. But if you use them for more than three days, your stuffy nose will get worse when you stop. 7. Smoking. Smokers get more colds than nonsmokers. They also get worse colds that last longer. Smoking damages cells in the lungs, making it harder for you to fight off a cold. If you’re sick with a cold, don’t smoke — and don’t let anyone around you smoke either. Flu seasons are unpredictable in a number of ways. Although epidemics of flu happen every year, the timing, severity, and length of the season varies from one year to another. Flu viruses are constantly changing so it’s not unusual for new flu virus strains to appear each year. How long does a flu vaccine protect me from getting the flu?. Multiple studies conducted over different seasons and across vaccine types and influenza virus subtypes have shown that the body’s immunity to influenza viruses (acquired either through natural infection or vaccination) declines over time. The decline in antibodies is influenced by several factors, including the antigen used in the vaccine, age of the person being vaccinated, and the person’s general health (for example, certain chronic health conditions may have an impact on immunity). When most healthy people with regular immune systems are vaccinated, their bodies produce antibodies and they are protected throughout the flu season, even as antibody levels decline over time. People with weakened immune systems may not generate the same amount of antibodies after vaccination; further, their antibody levels may drop more quickly when compared to healthy people. For everyone, getting vaccinated each year provides the best protection against influenza throughout flu season. It’s important to get a flu vaccine every year, even if you got vaccinated the season before and the viruses in the vaccine have not changed for the current season. Coughing is what you do when something bugs your throat, whether it’s dust or postnasal drip. Coughing also helps clear your lungs and windpipe. Many coughs, like those from cold and flu, will go away on their own. If yours comes from a more serious medical condition, you need to treat the cause. Whatever the reason, if coughing’s driving you crazy, there are ways to feel better. Drink plenty of fluids or use a cool-mist humidifier or vaporizer to soothe an irritated throat and loosen mucus. Prop your head up on extra pillows at night and have a little honey before bed. Studies show honey can help ease a cough. Don’t give honey to children under 12 months. If you’re coughing up mucus, look for a cough medicine that says “expectorant.” That loosens mucus to help you cough it up. If you’re coughing up a lot of mucus, check with your doctor to see what the best cough medicine is for you. Also, talk to your doctor before using cough medicine for serious conditions like emphysema, pneumonia, chronic bronchitis, or asthma. Don’t give cough and cold medicine to children under 4. You may get a dry cough with a cold or the flu or if you breathe in something irritating like dust or smoke. A cough “suppressant” helps stop your urge to cough. Plus, it can help you sleep better. Cough drops — or even hard candy — can stop that tickle in the back of your throat. Don’t give cough drops to children younger than 4. Never give cough medicine to children younger than 4 because it can have serious side effects. For children 4 to 6 years old, ask your doctor before giving any cough and cold medicines. They’re safe after age 6. For children 1 and up, try 1/2 to 1 teaspoon of honey to help them cough up mucus. Will Antibiotics Stop a Cough? Usually, no. That’s because most coughs are caused by viral infections like cold or flu and will get better in a week. Antibiotics only work on infections caused by bacteria. If your cough isn’t better after a week, see your doctor to make sure it’s not caused by a bacterial illness like a sinus infection or pneumonia. If it is, you may need an antibiotic. Allergies can make you sneeze, cough, or both. An antihistamine may help. Some newer ones at the drugstore won’t make you sleepy. If you’re also wheezing — where your breath sounds like whistling — you may have asthma and need to see your doctor. If you smoke, chances are you cough, especially in the morning. But that cough may be a sign of something more serious. Sometimes smoke irritates the airways and causes inflammation that turns into chronic bronchitis. It can also be a warning sign of cancer. If your cough seems different than usual, or if it lasts after you quit smoking for a month, see your doctor. If your cough lasts longer than eight weeks, a number of things could be to blame. Chronic coughs can be caused by acid reflux, or gastroesophageal reflux disease. They can be a side effect of ACE inhibitors, a kind of blood pressure medicine. They can be a sign of whooping cough and even heart failure. All of these conditions need medical attention. A cold or seasonal allergies? The leaves are gold, red and orange, the weather has turned cooler- and, as if on cue, your nose starts to run, your eyes are puffy and watery, and you suddenly sneeze several times. Is is a cold- or do you have a fall (or seasonal) allergy? 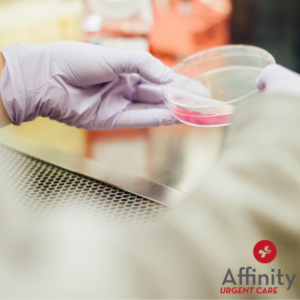 Affinity Urgent Care centers can help you diagnose your seasonal allergies without the use of needles at all! Schedule your appointment today! Can a test tell me which plant (or mold) is causing my allergy? Can my allergy be cured? Are there medications I can take? Are there lifestyle changes I can make to relieve my symptoms?